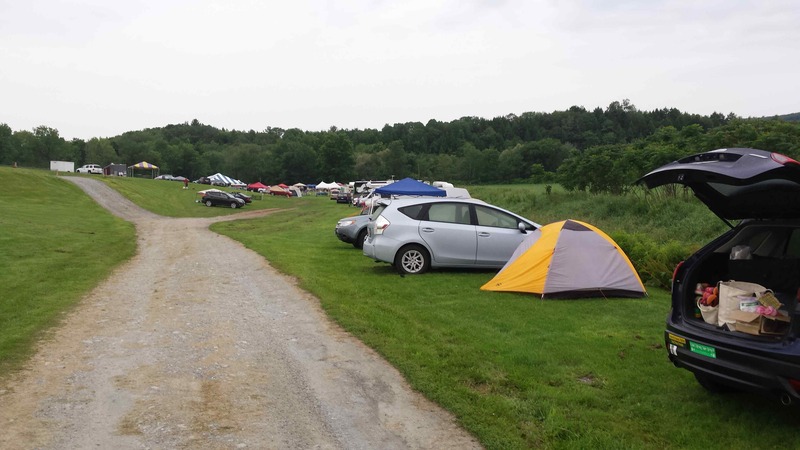 4th of July weekend at Sugar Bush Farm | Can I Bring the Dog? This going camping at a place where they are having an agility trial is really working for us. I did backpack camping as a girl, and having a car and an air mattress (hey, I actually like the camping pad better, but Chico prefers the air bed because there’s room for both of us on it), and a cooler makes it feel pretty luxurious. The people who tent camp are nice, and relaxed. They share food and advice about dogs and handling and the best way around a Snooker course. The 4th of July weekend was a big deal. Made my jaw drop when I drove in and saw two big rings and all those tents and cars. A well attended Canine Performance Events (CPE) trial and the USDAA trial Chico and I entered were both taking place. It was a big old barky party for three days. My tent is behind me. We’re at the far, far end of the whole gig, the USDAA ring is just visible, and there’s a whole ‘nother tent village past there. And to the left of that, down the hill behind the white SUV on the left, is the ring where the CPE trial was held. Chico and I teamed with Katie Todd and her inconsistent dog Jonah in the PVP tournament. No expectations, no goal besides fun with our dogs on hard courses that contained interesting handling challenges. We did SO much better than I could have hoped. Chico got a couple of Qs out of the five runs, our team made it into the qualifier group for a brief time over night Saturday into Sunday (to qualify your team score needs to be 75% of the average of the top three teams’ scores); then when both of us were eliminated from both the last two classes, we dropped right back down “below the [cutoff] line.” But here’s the delightful part, instead of ten or fifteen teams (or more at a really big trial), there were only six teams in PVP at this trial so we were in the ribbons. 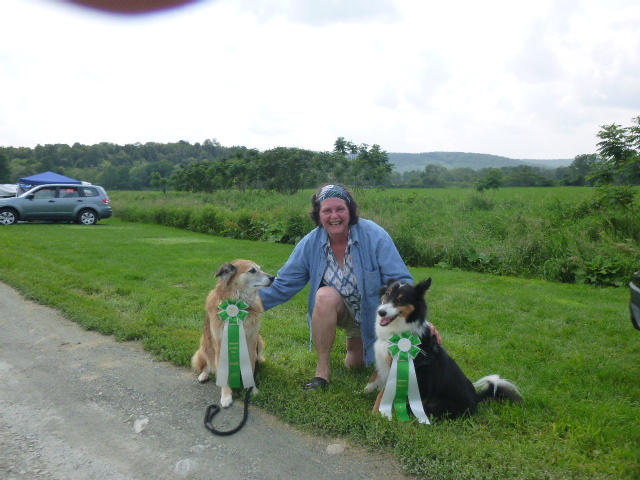 Katie, and Jonah and Chico with their ribbons. Doesn’t that Jonah have a sweet face? We must be the happiest bunch ever to take last place in something. Chico and I do so much better when I make sure to keep us in situations where I don’t put pressure on myself. It’s very interesting to me to pay attention to the things about myself that can be improved or changed and to see how those effect Chico. What’s going on in my head transfers so quickly and strongly to the way he feels. There’s some lesson for me here and the only parallel I can find is when parents learn that if they don’t make a fuss when a toddler has a gravity accident, the toddler is much less likely to burst into tears from said fall. So, I’m not just here to teach Chico things, but he’s here to teach me things too? 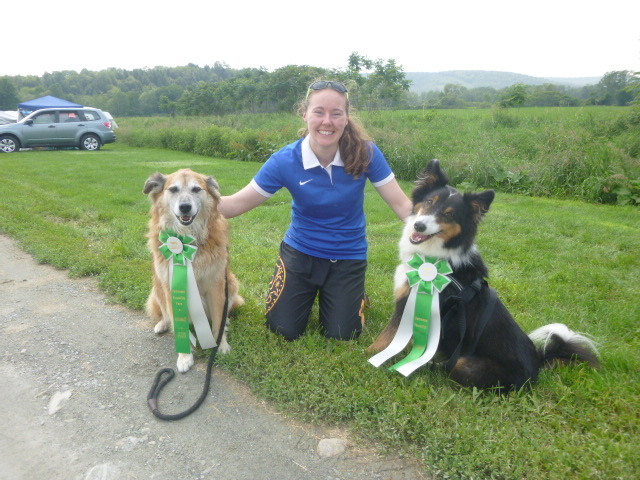 This entry was posted in Uncategorized and tagged Chico, CPE, Sugar Bush Farm, USDAA agility. Bookmark the permalink.